Upper Deck would like to extend its gratitude to all Certified Diamond Dealers that attended the recent e-Pack meeting during the Industry Summit in Hawaii. These shops provided invaluable feedback regarding the Upper Deck e-Pack™ platform and the impact it is having on the hobby. – Upper Deck has added a link to the dealer locator in the news feed and is actively working on adding a dealer locator as part of the e-Pack platform, as well as several other concepts that were suggested during the meeting in Hawaii. In addition, product releases exclusive only to hobby shops will be announced and marketed through the e-Pack platform. Upper Deck’s President Jason Masherah and others from the management staff at Upper Deck took time out to talk with shops about the platform at the Industry Summit. 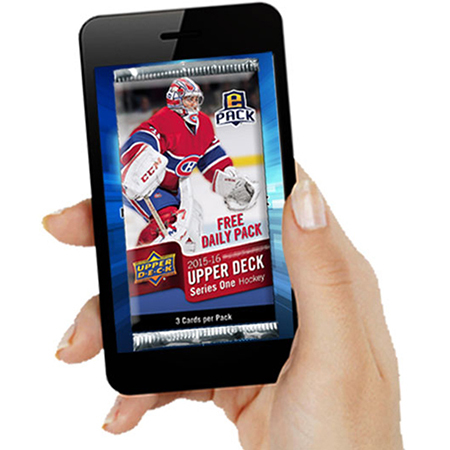 – Moving forward, Upper Deck will work to ensure that there is a better balance in regard to exclusive content available through e-Pack. In addition, Upper Deck will be adding new and exclusive content to hobby shop products as well. – The e-Pack product was printed at the same time as the UD1 hobby product. The only difference was in the wrapping of the product and that the overall quantity printed for e-Pack was significantly less than that of the hobby shop product. No additional product was printed for e-Pack. – Ratios and collations in the e-Pack product are comparable with Upper Deck’s hobby products. To ensure that inserts and ratios are consistent across Upper Deck’s hobby and e-Pack products, the company has hired Dynamics, a multi-award winning payment and technology firm to regularly audit and provide reporting on these products. – Hobby products will release prior to the availability of any product on the e-Pack platform. The amount of time between on-shelf releases and e-Pack releases will vary from product to product. – Only a handful of hobby products will be available via the e-Pack platform. The current schedule can be found above, and future releases will be announced as they become available. – Upper Deck is not planning to market e-Pack through physical hobby products or advertise e-Pack via any hobby publications. The majority of e-Pack marketing is geared towards lapsed collectors, general fans and consumers. 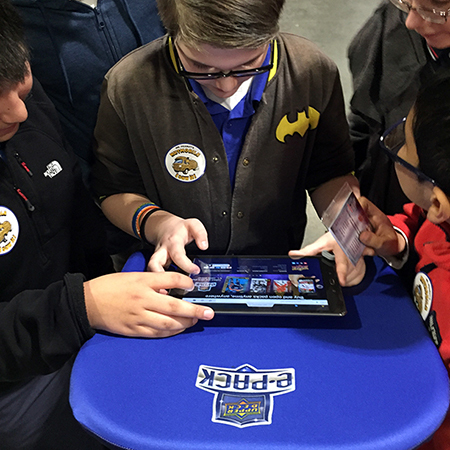 As Upper Deck has shared the e-Pack platform with fans at shows, it seems to be a big hit with younger fans who are used to engaging on their phones and tablets. Ultimately, the goal of e-Pack is to significantly expand the hobby as a whole by sharing the excitement of the pack-opening experience to fans everywhere. We appreciate the feedback that was offered at the meeting in Hawaii, and will continue to engage in dialogue with hobby shop partners as the e-Pack platform evolves. Still waiting on series two to be released . Its April now, March has come and gone. Correct, Jon, we are giving our hobby partners more time with the release to work through their inventory before we open it up to e-Pack. You will find 2015-16 NHL Upper Deck Series Two on e-Pack later on this month. Are there release dates yet for Goodwin and Ultimate? Goodwin will be out on e-Pack towards the end of August. We don’t have a date for Ultimate yet. Likely some time in October.